From the critically acclaimed author of The 25th Hour and When the Nines Roll Over and co-creator of the HBO seriesGame of Thrones, a captivating novel about war, courage, survival and a remarkable friendship that ripples across a lifetime. During the Nazis' brutal siege of Leningrad, Lev Beniov is arrested for looting and thrown into the same cell as a handsome deserter named Kolya. Instead of b… eing executed, Lev and Kolya are given a shot at saving their own lives by complying with an outrageous directive: secure a dozen eggs for a powerful Soviet colonel to use in his daughter's wedding cake. In a city cut off from all supplies and suffering unbelievable deprivation, Lev and Kolya embark on a hunt through the dire lawlessness of Leningrad and behind enemy lines to find the impossible. 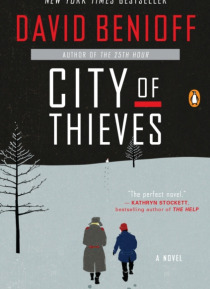 By turns insightful and funny, thrilling and terrifying, the New York Times bestseller City of Thieves is a gripping, cinematic World War II adventure and an intimate coming-of-age story with an utterly contemporary feel for how boys become men.